Eliminate odors without the use of masking perfumes. FreshDuct Industrial Strength Odor Eliminator infiltrates and neutralizes odors at the source, leaving behind a fresh scent. Contractors and Wholesalers Request your free sample today. 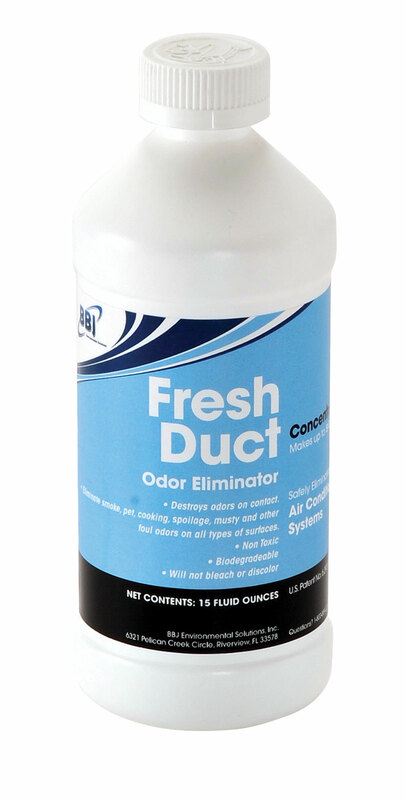 Q: Why is BBJ FreshDuct Odor Eliminator necessary for use in air duct systems? Air ducts -- as well as crawl spaces, attics, basements, above ceiling spaces and other areas -- often contain odors caused by smoke, pets, cooking, spoilage and other foul odors. BBJ FreshDuct Industrial Odor Control and Eliminator is specially formulated to control odors and other sources of indoor pollution gently but effectively. It freshens and deodorizes interiors of both lined and unlined ductwork. It is equally useful in basements, crawl spaces, attics, and areas above suspended ceilings where objectionable odors originate. Q: Is BBJ FreshDuct Odor Eliminator just a fragrance? With its special formulation, BBJ FreshDuct Odor Eliminator doesn't just mask odors, like scented sprays and perfumes, it infiltrates and neutralizes odors at the source. BBJ FreshDuct Odor Eliminator contains BBJ Enviro-Gard, an encapsulation control agent that controls odors by both encapsulating and breaking down odor molecules, while time releasing a fresh fragrance. BBJ FreshDuct Odor Eliminator leaves the air fresh and clean. Q: Is BBJ FreshDuct Odor Eliminator easy to apply? BBJ FreshDuct Odor Eliminator is user friendly and there is no need to evacuate the premise during application. No special clothing or equipment is necessary during application. It is easily applied with the use of a compressed air sprayer or fogging device. Thoroughly saturate all areas to be treated and leave wet. There is no need to rinse. BBJ FreshDuct Odor Eliminator will not bleach, stain, or discolor most fabrics or any surfaces. 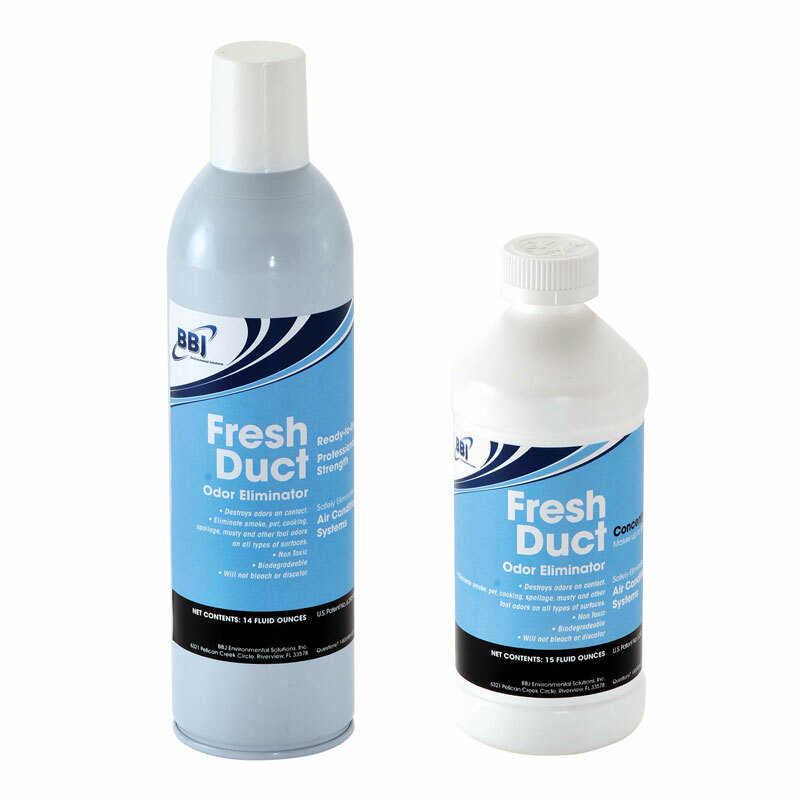 Commercial duct cleaning equipment should be used to remove dust, dirt, mold, dander, spores, pollen, and other debris from ductwork before applying BBJ FreshDuct Odor Eliminator. Q: Can BBJ FreshDuct Odor Eliminator be applied using the professional strength 14 fluid ounce can? BBJ FreshDuct Odor Eliminator is user friendly and formulated with non-toxic and readily biodegradable ingredients. With the air conditioning fan running, simply spray FreshDuct into air intake vent allowing it to be drawn into air conditioning system by air movement. Apply until BBJ FreshDuct Odor Eliminator can be lightly smelled throughout the home. Reapply as often as desired. For other areas (automotive interiors, draperies, carpeting, bathrooms) or fabrics, spray evenly a light mist in areas where odor is originating or on fabrics.